I have been going through some photos from way back and came across this, I think it was in the Model tent at the Masham steam rally North Yorkshire. From what I can see on the notes, it has a 9cc Vee engine that runs on methanol, radio control on steering, neutral, forward, reverse, and brakes. Anybody come across this model, I can't remember the year I was at Masham. Mike. There are a couple of those that race every summer at the Classic races at Laguna Seca outside Monterey, CA. They make a distinct sound compared to most vintage race cars. By the way, it's a Morgan, not an MG. It's a beautiful model in any case!!! Apologies for wrong title now changed to what it should have been Morgan it's a age thing. It's a fantastic model, a pinnacle of craftsmanship. However, of the original from which the model derives, I'll have to paraphrase Margaret Halsey and say that it looks as if it were designed by someone who had often heard automobiles described, but had never seen any. Morgan were well aware how to make conventional 4 wheel models, and still are I think. 3-wheelers at one time had a lower Road Tax rate in UK hence Bond, Reliant and Morgan made them . ( IIRC the BMW Isetta bubble car had 4 wheels but the rear pair were closely spaced and came into the same Tax Band as 3-wheelers ). Yeah, there was something about that but I think you needed the full car licence if it had reverse ..
Once went to Mallory Park with a mate in his Bond minicar .... terrifying experience .... thought it would roll on every corner but it never did. God only knows how they stayed upright ( or sort of ). If there was a Guardian Angel for Bond drivers he/she must have put some hours in. Dunno though. Maybe Bonds found some way of defying Newtonian Mechanics. ? EDIT Jason nipped in first with the reverse gear thingy ... Must have faster fingers .. Believe it or not, but Morgan are still making 3 wheelers! Here in Kent we have a lovely little museum devoted to 3 wheelers and Morgans in particular. http://www.morganmuseum.org.uk/1909-morgan.html. Well worth a visit if you are in the Tenterden/Rolvenden area. The museum is behind a rather nice little antique shop. 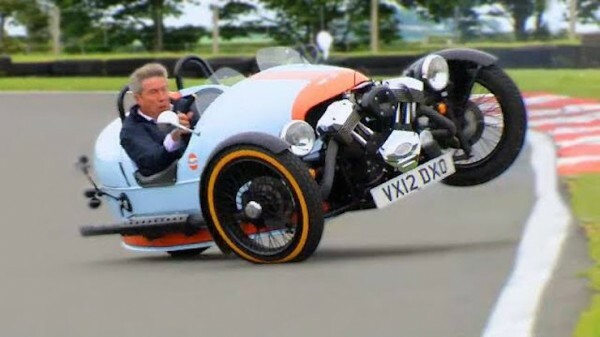 You have to remember that the Morgan has two wheels at front and one at rear. They are quite stable, so were cars like the Berkeley T60. The Bond and Reliant with one at the front and two at the rear were notorious for falling over. I remember many years ago driving up the road near me watching a Reliant coming in opposite direction. Next minute it was upside down spinning in circles on road in front of me. I stopped, helped the guy driving turn it back onto its wheels and off he went again. I used to service a lot of Isetta 3 wheelers. These were two at front one at rear and again surprisingly stable. I remember towing one down the M6, when the driver tried to overtake me (just for fun!!!) the tow rope was at 90 degrees between us (both in different lanes) but it still did not fall over. A friend of mine did actually manage to roll one going round a 90 degree left hand corner. So strong it only had a slightly dinked headlight, rolled it back on wheels and off he went again. I remember tales of reliants going down hill and doing a cartwheel across roundabouts and their occupants not surviving as the body work on the car disintegrated as they did not have roll over bars . Bad Behavior has blocked 15819 access attempts in the last 7 days.